Browse the Photo Personals at PenPalsPlanet.com Right Now. You want to know how to find Mr Right? Join millions of other women out there. They too are looking for Mr Right wherever and whenever they reasonably can. There’s nothing wrong with looking for Mr Right — of course not, why would there be — but a problem starts to creep in if a woman spends years and years — even decades — trying to find Mr Right. By that time she starts to experience loss of hope as well as a creeping cynicism that she will ever find the right guy. This is to be expected of course, but let’s look more closely at the situation. To begin with, most women start out looking for Mr Right and they might spend time going out or at online dating sites to meet single guys or in attempts at finding the right guy. Then what happens? Well, in a lot of cases — maybe most cases — she finds the right guy. They get married, have children, maybe later they fall out and get divorced — stuff happens. But the point is that in the beginning of the relationship she felt at least that she had found the right guy. So, this is what happens to most people, but what we are concerned about here is the proportion of women who can’t find their Mr Right no matter how hard they look. We are concerned here with the women who go on for years and even decades trying to find the right guy but without success. Carole Smith puts their situation well in the article that follows. However, within the article at least there does not appear to be an answer to the dilemma of these women. Yet, of course there is an answer. If there were not then most women who start out looking for mr right would not end up in a relationship or married. So what is the answer? It will not be the same for every woman, but I’ll give you my ideas on this once you have read the article (warning, don’t get depressed, there is hope, just read what I’ve written below the article, here at SingleDating.com). Okay, so what are we going to do about this: how are we going to find Mr Right for this proportion of women who go on year after year, decade after decade looking for the right guy but never finding him…? If you were running a business and not getting the results you wanted, or you were running a scientific test that didn’t result in your expected aims, then you’d go back and analyse what went wrong, wouldn’t you? But don’t get me wrong, in the search for Mr Right there are women who analyse themselves over and over and end up still repeating the same mistakes. In other words you have to analyse in a systematic way, as if you are trying to solve an equation almost. Then apply what you have learned and if it doesn’t work try another approach. This self-analysis when you are trying to find Mr Right isn’t easy and runs the risk of going wrong and increasing anxiety. You need outside help, perhaps in the form of a relationship coach. Certainly you should be reading widely on the subject of successfully attracting the right person and on successful relationships. There’s a wealth of useful advice here at SingleDating.com. 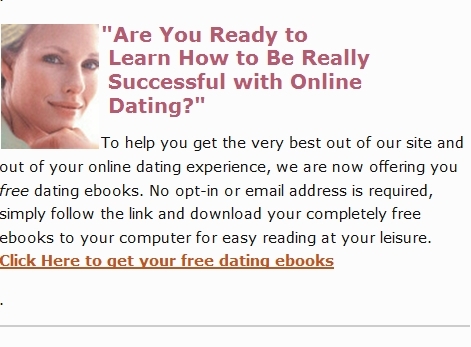 Read the Internet dating ebooks at Online Dating Ebooks. Note that you can get several free ebooks here at SingleDating.com, no opt-in needed. Also check out our advice articles at Dating Advice and Tips. The point is, you need to read widely, seek outside help if necessary and in general take the whole thing more seriously. Instead of just relying on hope and becoming more and more desperate, adopt a positive analytical approach. Try to see yourself as others do and try to see what is holding you back. Look at successful relationships you know of and try to work out why they work, even how the people concerned met. Finding Mr Right is a big topic and you aren’t going to solve the problem overnight. Accept that and at the same time totally change your approach to the whole thing. Study, analyse, get outside assistance, test what you’ve learned, adjust and eventually… succeed! Stephanie Constantina writes for SingleDating.com. The content by her on this page and on other pages at SingleDating.com is copyright and exclusive to SingleDating.com and may not be reproduced elsewhere. If you wish to reproduce one of her articles then go to her archive of publicly reproducible articles here: Stephanie Constantina, EzineArticles.com Expert Author. Stephanie Constantina recommends PenPalsPlanet.com for online dating. Search for Mr Right at PenPalsPlanet.com: Browse the Photo Personals Now. Don’t forget to bookmark this finding Mr Right page! “The definition of stupidity is doing the same thing over and over again and expecting different results” (Albert Einstein). Bit harsh in the context of finding Mr Right, Steph!